Even if nobody is perfect, when your soulmate comes, you might consider them as one. Not every person is compatible with you because you’re a unique being who has unique needs and flaws that only a few people can truly satisfy. And this is to a degree. But your soulmate comes like the perfect piece of the puzzle, and you cannot even explain how perfectly it fits to your uniqueness. You will spark from within because that is what they have come for. And it’s a two way street, both of you bring out the best in each other. There is almost no friction between the two of you, just a divine lightness that feels like a breath of fresh air. You feel like both of you together can manage every problem and face every fear. When both of you are together others can feel your powerful connection. Having a soulmate encounter is divinely guided, hence, you should be highly aware of the kind of people that you allow to enter into your life. If not, you’ll end up with the wrong people who bring more pain than happiness. You do not want to miss your soulmate. But don’t worry, when your soulmate comes, there are some powerful signs that happen to you to let you know they are the real deal. 1. You no longer fantasize other people. Asking yourself how it is to be like with other people even if you’re in a relationship is normal and even healthy. You do it just for curiosity’s sake. But when you’re with a soulmate, such thoughts would not even occur in your mind because you know that you’re with the best person in the world and you couldn’t ask for more. 2. You feel a magnetism towards this person. There’s a time in your life when you make a resolve not to entertain any serious relationship at the moment because of a specific goal you’re working on. Even if you meet your soulmate, you avoid as much as possible to get connected with this person. Yet, you keep bumping into each other as if fate has led you into each other’s arms. 3. You feel their strength in your weakness. While it’s common to hear ‘like attracts like’ there’s also what we call ‘ opposite attracts’, though, it’s not what you lack that attracted you to them. It’s only that you complement each other. They have what you lack and you have what they lack. In a way, there’s a kind of balance in the relationship. 4. You open up to them much easier. In your previous relationships, you created a boundary in which you only open up things that you’re comfortable having the other person know about. With your soulmate, you easily open up to the things that you kept a secret within yourself for quite a while, though you hardly know them. It’s like you can tell them everything. 5. You feel in tune with what they’re thinking. Even if they don’t tell you what they’re feeling, you just know it. Or, when you’re having a bad day, they also sense it and will do their best to cheer you up. When in a crowd, you know what the other is thinking just by looking into each other’s eyes. 6. You’re more passionate than ever before. Passion makes the relationship runs deep. While you’re being passionate in your previous relationships, you’re feeling it twice with your soulmate. Though you’ve been together for a longer time, you still feel the butterflies in your stomach whenever the two of you meet and sparks seem to fly every time you kiss. 7. You straighten things out easily whenever a petty fight arises. In normal relationships, conflicts arise from to time. Whenever you two have one, you’re able to forgive them easily despite the mean things you or they have said. They also do the same with you. No one is too proud to accept the mistakes done because you both want the relationship to work out. 8. You want the same thing that they want. Surprisingly, the things that they want are the things that you want too. You’re not making any compromises just to please them. Planning for your future isn’t hard because you agree with each other without having to argue as to whose plans or aspirations will be followed. 9. Your life is an open book to them. Because you’ve been honest with them since day one, there’s nothing that you feel you should hide. They know every problem that you have and every quirky thought that comes to your mind. You lay all your cards on the table because you know they won’t criticize you nor judge you and you can discuss practically everything. They’re there to listen to you and give you encouragement whenever you need it. 10. You laugh at their silly jokes. Having the same sense of humor, you both enjoy a good laugh. Even when things are hard, like when one of you loses a job, you’re still able to put a smile on your faces. Life is very much bearable because you two know how to deal with it lightly. 11. You see the value of each passing day. A day spent with your soulmate is a day full of fun, adventure, and lasting memories. You always look forward to each day because you know every second with them is filled with meaning. Trying new things come as an adventure to cherish for. 12. You see love differently. Having been in love for a number of times, you thought you already know what love is. But everything has changed since the day you meet your soulmate. You never thought you could love that much nor feel loved by somebody that much. Love suddenly has a different meaning and it’s something you can hardly explain. 13. You can’t think of breaking up from the relationship despite your arguments. Breaking up is never an option whenever you engage in arguments. Unlike your previous relationships where breaking up is the only available means to stay sane, with your soulmate, breaking up is never even an option. You both know that arguments are part of your communication and self-expression. When it’s heated up, you both know how to cool down and pacify each other. 14. You respect their need. You’re not offended nor take it personally whenever they ask for an alone time. You respect them the way they respect your individuality. You both understand that each of you needs some space to grow and give it every time one of you asks for it. 15. You’re very much prepared to meet them even if you feel you aren’t. Though there is never a specific timeframe that says you’re ready to meet the “one”, they just arrive at the time you least expect it. Interestingly, you respond to the connection with openness even if deep inside you’ve just been contemplating that you’re not ready yet for another intimate connection. The previous relationships served as your training ground so that when you encounter your soulmate, it would be for keeps. Everything happens for a reason. 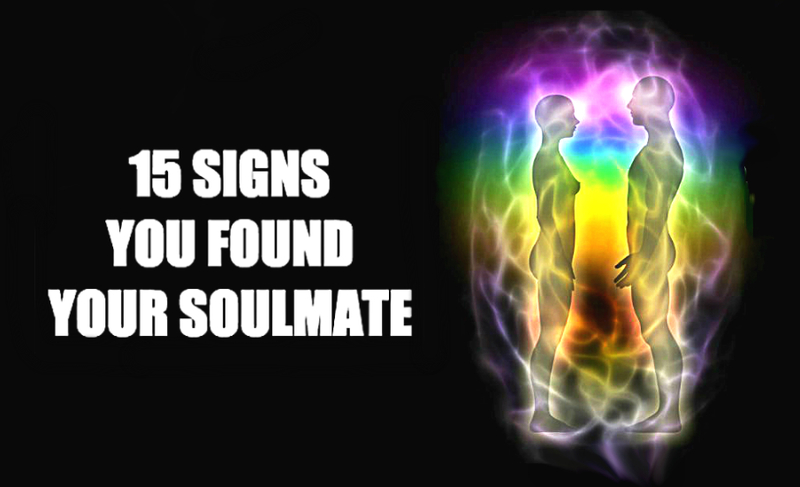 Having meet your soulmate at such time and place has always been designed to take place.